The advantages of this strategy are clear. A huge annualized return can be realized based on certain assumptions like share price and short call premiums remaining constant during the 6-month time frame. We also have protection against catastrophic share loss below the $85 put strike. By selecting a 6-month put, the monthly cost of this protection is decreased compared to buying a put each month. In addition to this, there is opportunity to generate additional profit if share price moves up to the strike of the short call. One of the disadvantages of weeklys is that we have 4 – 5 times the amount of trading commissions compared to monthlys. Assuming a reasonable fee of $10 per trade, that computes to $260 for the 6-month time frame, assuming 1-contract trades. Let’s add $20 in commissions for the purchase of the shares and then put. Therefore, over the 6-month time frame, the short calls must overcome a net debit of $430 + $280 = $710. Based on a weekly premium of $125, we breakeven after 6 weeks. Keep in mind that we paid $102.22 for the shares and we are using a security with high implied volatility as defined by the proposed strategy. If share price declines (we must be prepared for this) we start losing money and we will not break even for 6 weeks. For traditional covered call writing we are managing two positions: the long stocks and the short call. In the proposed strategy, we are also managing the long put position. The investor must be capable of managing all 3 positions. In addition to this, if share price moves above the short call strike, we must roll the option in order to retain share ownership. This will most likely impact our $125/week premium goal as the time value of a short call will decline as the strike moves deeper in-the-money. Rolling out and up may actually result in a short call debit. Rolling will also result in more trading commissions further eroding the profits from a theoretical trade. Two times within the 6-month time frame, there will be an earnings announcement. I strongly believe that a short call should not be written in those 2 weeks, thereby decreasing returns from the theoretical stats we archived above. The strategy, however, does require us to retain the shares through these two earnings reports and that may result in a dramatic share decline if the report (s) is disappointing. Now we are protected below $85 because of the long put but there’s a lot to lose between $102.22 and $85. Of the three securities mentioned by Gary, IBB does distribute a quarterly dividend. Although unlikely, there is the possibility of early exercise, when expiration occurs after the ex-dividend date. Should the shares be assigned because of the ex-date, new shares would have to be purchased at the current market value and who knows how this would impact our theoretical returns. There are ways to avoid early exercise resulting from ex-dates but that would involve sophisticated management skills and would not be guaranteed. What is the basis for selecting the underlying security? For traditional covered call writing (according to the BCI methodology) a stock or ETF is chosen based on three factors: fundamental and technical analysis as well as common sense principles like minimum trading volume and avoiding earnings reports. In this proposed strategy, it appears that the main criteria for selection is option returns and liquidity. Quantity seems to take precedence over quality. What about the 6-month time frame? There are many ways to make money in the stock and option markets. The proposed strategy may be one of those ways for certain investors. One key point is that there are no free lunches and every strategy has its advantages and disadvantages which must be evaluated before risking our hard-earned money. For the week, The S&P 500 rose by 1.2% for a year-to-date return of 14%, including dividends. Protective puts are usually either done as collars on the stocks/ETFs directly or on SPY. You’ve introduced a third approach which is to use them on high IV tickers. A fourth approach is to use them on weak tickers. The theory being if the market does go down, these will go down even more. And if the market goes up, these are less likely to go up as much. So in one scenario you gain more from them and in the other scenario you lose less. You could also buy a “higher” strike put as a guarantee, which would limit your lose in the case of an underlying that melts down. My initial comment should also include that this strategy would also maintain the upside potential of the underlying stock, without using a covered call. 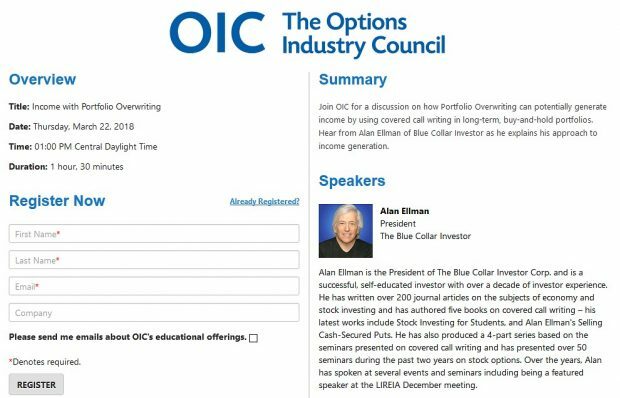 I have enjoyed reading this strategy very much and as collars are traditionally very conservative approach, I am eager to find out how you and the blue collar investor help me? You produce the weekly screen that is geared towards selecting the candidate for the monthly covered call. I would have thought that one would need something very similar to that for this new strategy, or modify this screen by having another column for the new strategy and the stocks that are suitable for collars would have a check in this column. I feel that we need more than just candidate selection news letter as lot more is involved with this weekly strategy. Let me clarify: This is not a new strategy proposed by the BCI team. It is a discussion of a strategy proposed by someone one of our members spoke with. When I received Gary’s email I felt our BCI community would find the assessment of interest and we are all here to learn from each other. We welcome additional comments like those from Steve and Gary. Now the good news is that the very same stocks and ETFs found in our weekly reports are also eligible candidates for selling weekly options with or without protective puts. As far as which calls to sell and puts to buy, that is based on our weekly initial goals and the amount of protection we want to buy. The BCI team has plans to incorporate additional strategies into our educational products, the next one being put-selling, the topic of my next book, coming out this month. This week’s Weekly Stock Screen And Watch List has been uploaded to The Blue Collar Investor premium member site and is available for download in the “Reports” section. Look for the report dated 11/21/14. You suggest using options that expire on the third Friday, and of course I’ve always heard that too. But when I look at the options chains online, there are options expiring every week. I finally thought to google “options expirations dates” to figure out what is going on, and now I realize there is such a thing as weekly options, and that there is a “w” by the weekly dates and no letter by the monthly ones (and likely a “q” will be by the quarterlies). I also googled “options expirations 2014” to be sure. Expiration dates can be universally distinguished by the date within the option ticker symbol. Not all securities have weekly options…most do not. For that matter, not all stocks and ETFs have options at all but many more have monthlys. I bought your book Exit Strategies for Covered Call Writing and it has been very helpful. I do have a question about the mid contract unwind exit strategy as I contemplate using this on LOW. LOW had a gap up after earnings last week. The question relates to the 20% rule of thumb. You state that we should consider buying to close during the first two weeks when the time value of the option drops to 20% or less of the original option premium. In this case, the call option that I sold was OTM and had significantly more upside potential (4.9%) than time value (1%). Does the 20% rule apply to the total (upside plus time value) or just to the time value component? If I compare the time value remaining (0.31)to the original premium (0.59, all time value) I get 53%. It does not meet the 20% rule. However waiting to collect the remaining time value would return only 0.54% I think I could make more than this on another position even in the current low volatility environment. If I compare the time value remaining to the total of the original premium plus upside potential (0.59 + 2.79), the ratio is 10%. Viewed this way it does look like it meets the 20% rule. The confusion is understandable. I did not develop the mid-contract unwind exit strategy until after publication of the exit strategy book. A detailed description of the MCU strategy is in the Complete Encyclopedia and our latest DVD Program. The 20%/10% guidelines apply to declining stocks. Here we have an accelerating stock price (glad you did so well…close call!). When you sold the $60 call, your shares can only be worth as much as $60 no matter how high the market price travels as long as there is the option obligation. So right now your shares are worth $60. If you buy back the option @ $3.55 (I’d try a limit order of $3.50 first), you have a net debit of $3.55 – $3.24 (share value with no option obligation) = $0.31 or .5%, a half of 1%. Closing the position and selling the shares will allow you to take the cash and establish a new cc position and therefore a 2nd income stream in the same month with the same cash that should easily be more than 0.5%. What are your thoughts on the use of trailing stops? You may have covered that in a prior blog but I missed it. We are in a long stock and short option position. Owning the stock establishes our cost basis and gives us protection against catastrophic loss if share value appreciates dramatically. Therefore, if we are considering closing a position, the short call must be closed first. This is where our 20%/10% guidelines kick in (see the exit strategy chapter of the Complete Encyclopedia…or in our DVD Program). Now once the short call is closed, selling the stock may not be the best choice. It may be re-selling the same option or rolling down. The takeaway here is that you don’t want to sell the stock before closing the option position (most brokerages will not allow this anyway for our own protection). On the recent number of analysts raising the price target for Apple computer: This information is about as useful and daring as a weatherman’s forecast for a 50% chance of rain. When you speak of also having to manage the long put position, please could you elaborate? Wouldn’t the put be a set and forget for six months? I wish it were that simple but the reality is that we are in 3 positions with the proposed strategy: Long the stock and put and short the call. Now owning a put does not preclude the need for position management…situations can change. For example, the price of the stock may increase significantly which may lead to the mid-contract unwind exit strategy. If we close the long stock and short call, what do we do with the long put? Perhaps we should sell it and generate whatever time value premium still exists? Maybe hold it if you think there could be a price decline. Perhaps share appreciation is slow but steady and you no longer feel the need for this “insurance” When do we sell the put? If there is a price decline, put value will accelerate. Do the math…perhaps we should close all positions and move to a stronger financial soldier? As share price changes, do we re-set the strike of the put? The fact remains that just because we bought a 6-month put does not mean that we can’t re-evaluate the situation and choose not to remain in this trade for the full time frame…This is why I don’t like taking a long-term position on any one stock in the cc writing and put-selling accounts in my portfolio. It’s not a bad approach, I just think we can do better with short-term obligations. Many can “juggle” 3 balls instead of 2…we must make sure that we are one of those people before committing to a particular strategy. SO GLAD TO LEARN OF YOUR RECENT SUCCESS SELLING PUTS! This Friday we will begin taking pre-orders for my latest book, “Selling Cash-Secured Puts” All those on our mailing list (all premium members + those receiving our weekly newsletters are on the list…if not, you can sign up on the top right side of blog page) will be receiving a discount promo code. Premium members will also receive their member discount. I should have the first several hundred copies in my possession by mid-December when shipping will begin…whew…just in time for holidays. I started writing this book a year and a half ago…hope you enjoy and benefit from it. 1: Is exercise automatic if strike is in-the-money at expiration? Generally, yes. Check with your broker to see if they have any other guidelines but this is the norm…same as selling calls. 2- If shares are “put” to us, can they be sold immediately? (sorry I lost the name of the person who sent this email…seminar travel and new book has been dominating my time).